This is fascinating to me, thanks so much for sharing. Regarding the transfers, can I ask which ones you used? I only see water slide transfers when I search for them but you mention plastic printed labels. Also, you mention internal mods, what do you have in mind? I was thinking about trying to make the table lamps light up with micro LEDs rather than having roof lighting. 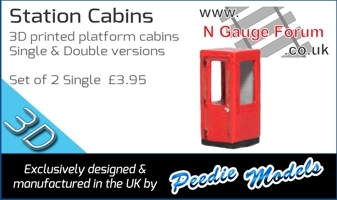 The Hornby OO Pullman’s have this and I believe the N gauge Brighton Belle carriages do as well. this is the correct set of plastic labels. They are like vinyls but have a greater rigidity. 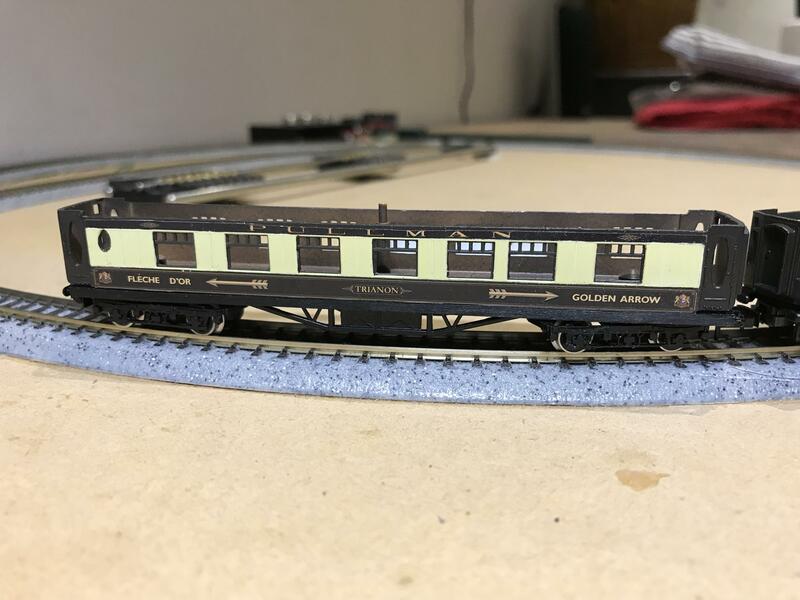 whilst rummaging around for the King Arthur I remembered I had the Arch Laser kit to convert a G siphon into Winston Churchill's funeral coach. 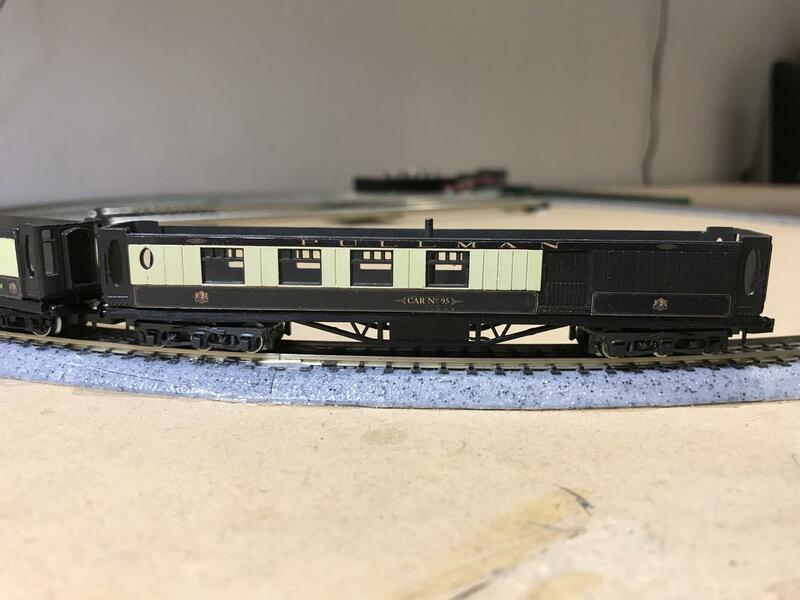 As it can be used with Pullmans and carried the same livery (as now restored) I decided to start putting it together. It's a bit fiddly but worth the extra work. First coats of paint and it looks quite good, although the wood grain is hard to smooth. Are you using acrylic paint? if so, because it is water based it will always bring the grain up, ideally you need oil based paints to stop this happening. The wood was sealed prior to painting, however it is a very open grain ply and to fill out the grain completely would wipe out the detail. This photo illustrates the problem with laser multi depth cutting. 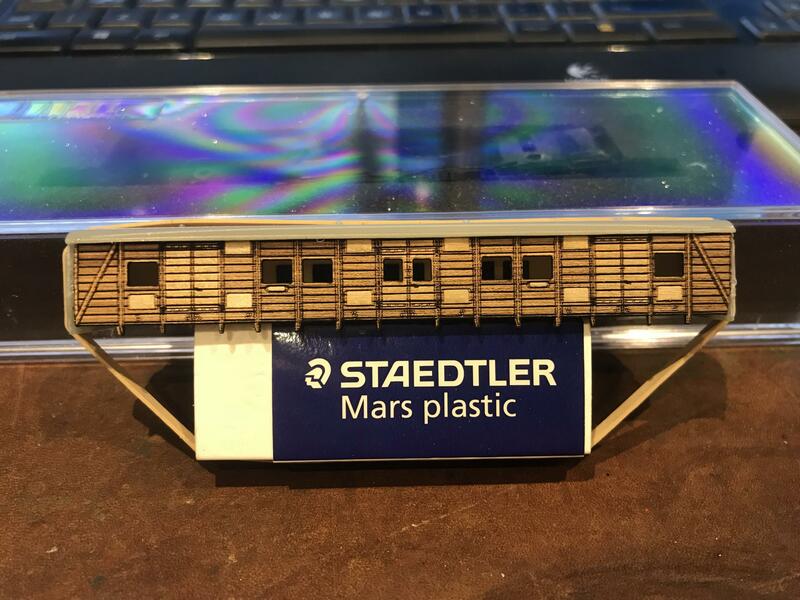 Where the laser does not burn the wood is smooth and where the surface is burned to form panel detail it is rough, and its not a wood grain problem. Unfortunately there is no way to sand these areas efficiently, and over painting only has limited benefit. This is particularly a problem at the paint edge as a brush picks up the rough surface, however this can be partially solved with an indelible brown felt pen to draw the edge with a steel rule. The model will get a lite rub with a fiberglass pen and a coat of gloss varnish which will also improve the situation. 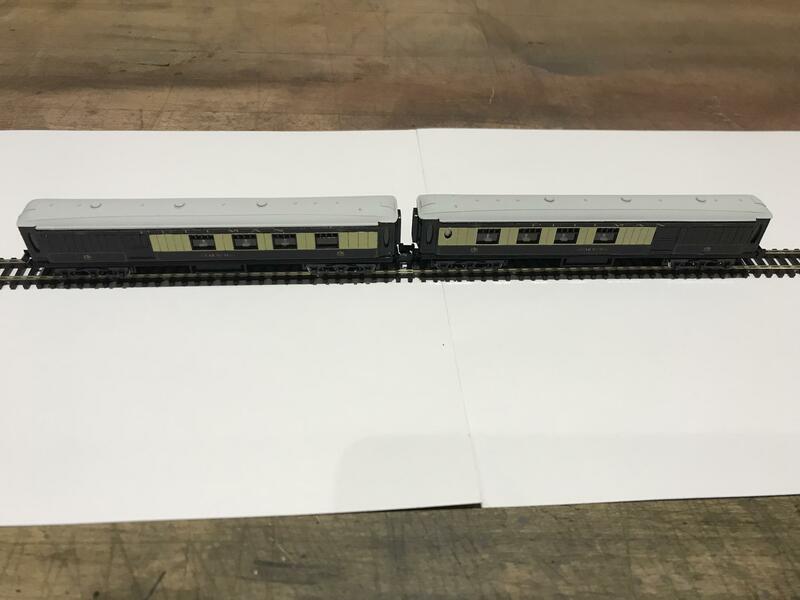 The brakes Car No.94 and Car No.95 are 12 wheeler coaches. 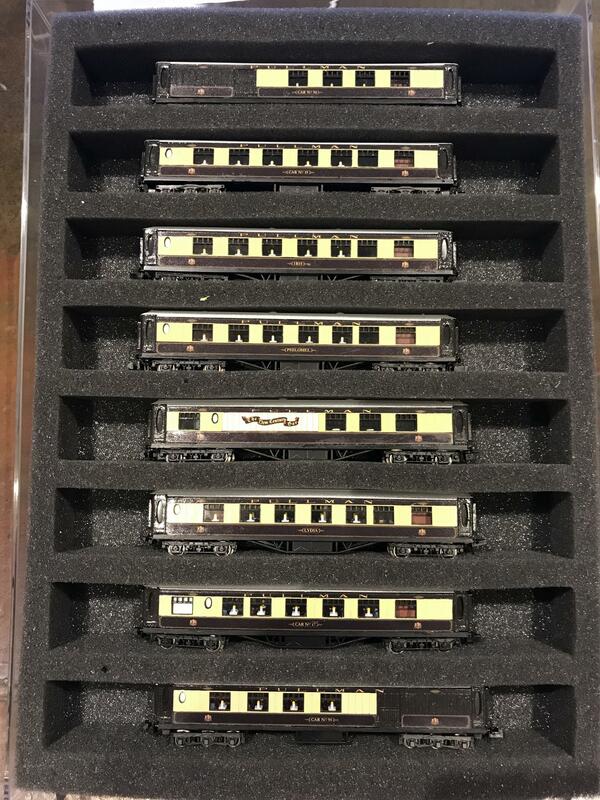 and with a little work Atlas/Rivarossi Pullman bogies are perfect. The under body will need modified to suit but that's simple. 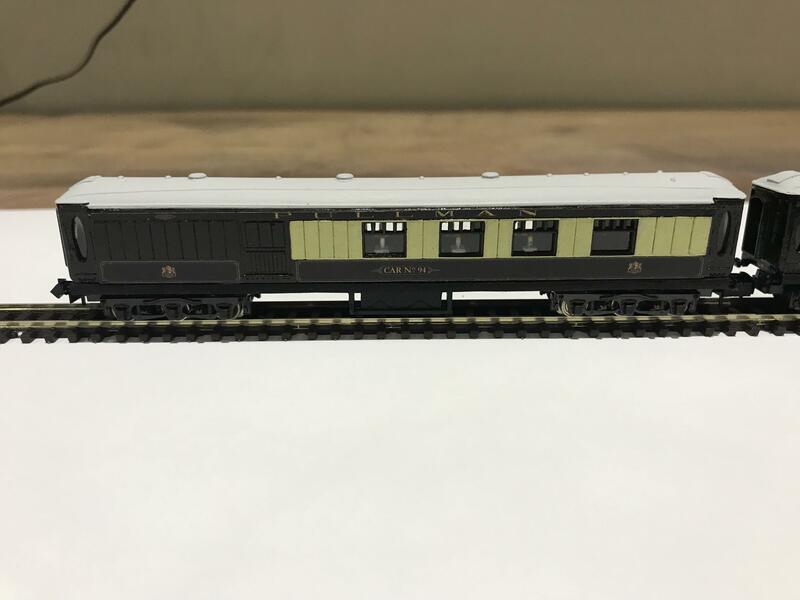 Im starting to assemble the two Brake 12 wheeler coaches. I have added partitions and I will paint the chairs and tables before assembly. The bodies have been sprayed with gloss varnish. 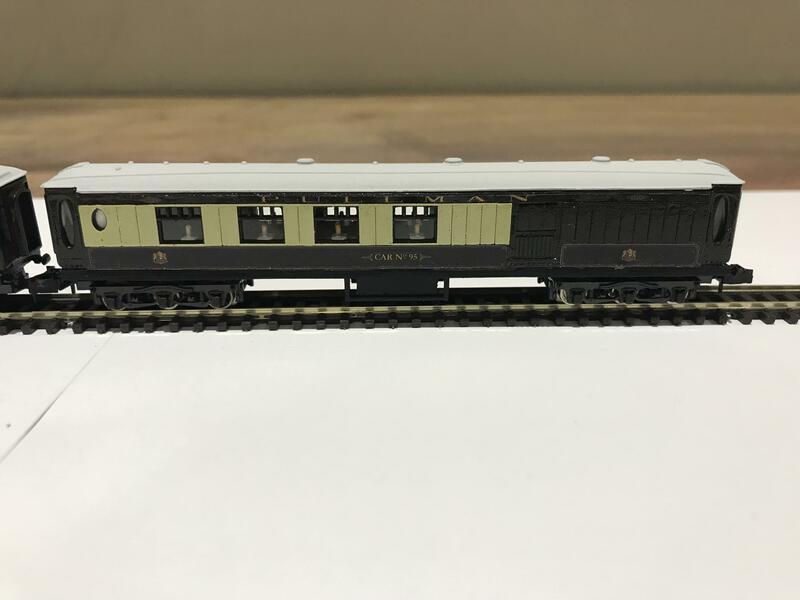 Many years ago, IIRC, Colin Allbright did a modification where he omitted the underframe, mounted the new 6 wheel bogies (like the ones you are using) directly to the body floor, and then handrail knobs and wire for the trusses, and cast battery boxes, dynamo, etc. It was in a society Journal of the time. It's a question of how far you want to go. 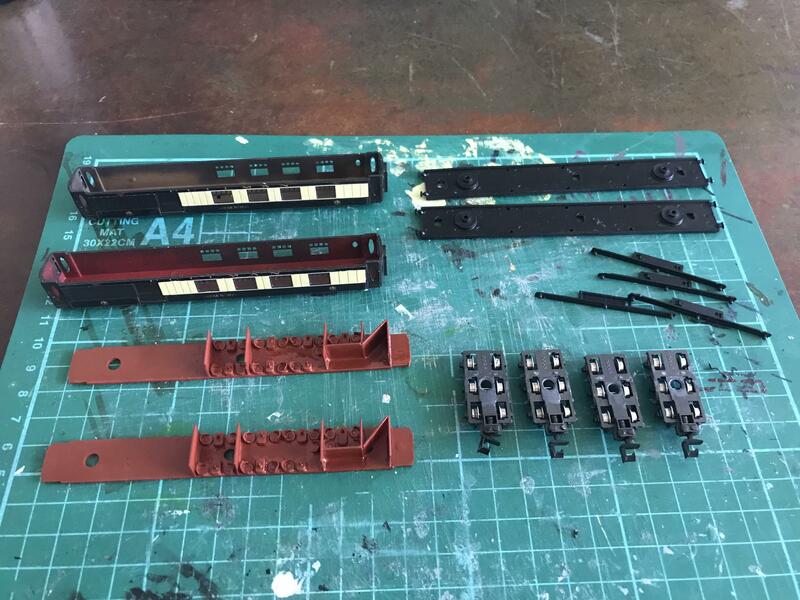 The bogies I am using are direct substitutes for the Farish bogies with little adjustment, and if I was going that far I would hand paint the coaches and print my own transfers. This exercise is to make best use of the Precision Labels product. 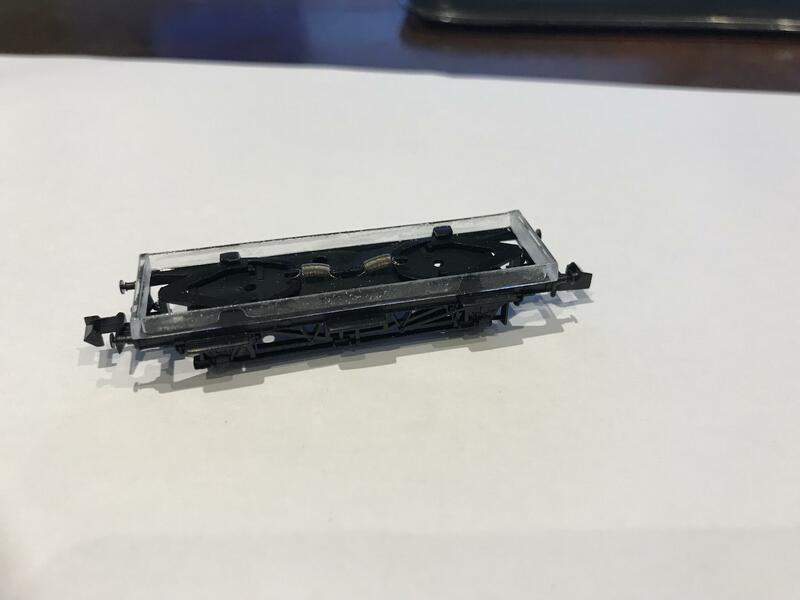 I think I have seen that article and my memory is it was a 2mm conversion. For not a lot of work i'm very pleased with the results, and I am looking forward to completing the two rakes and running them at our open day. I agree its how far do you want to go, and you've certainly made a very good job of what you have done. i just didn't know if you knew of, or wanted to try, to do the conversion I suggested. The problem with the original Farish Pullmans is they are generically incorrect. 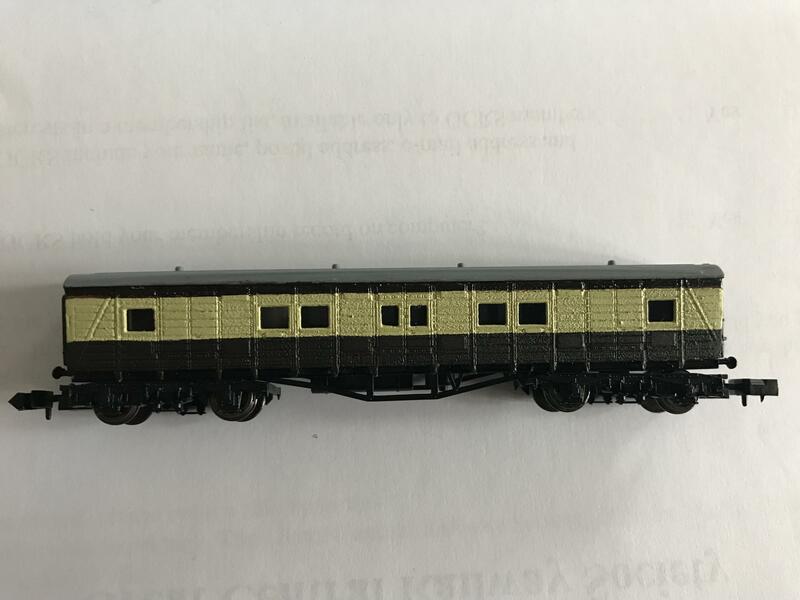 In effect they are compromises of the expected characteristics of a Pullman, however not truly correct for any prototype being closest to parlor kitchens. So to "correct them" would take more effort than making them new from the various brass etch sides available. 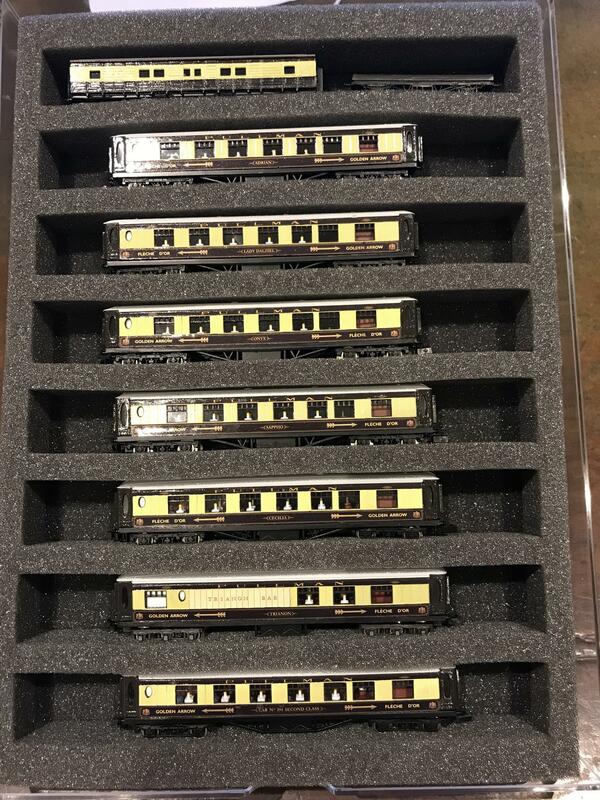 Having said that 95% of people at shows would never know the difference and treat them, as I do, as a faithful representation of the Golden Arrow and Dover Boat Trains. 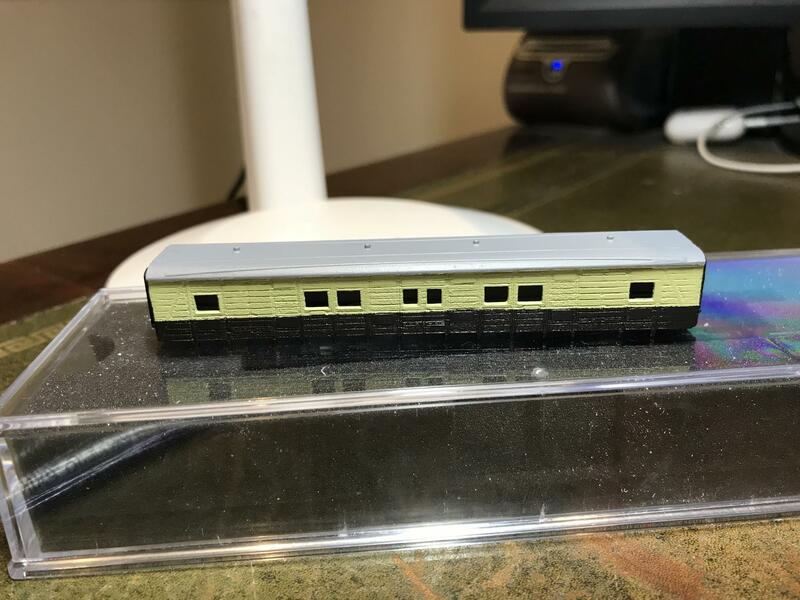 They are also considerably better than leaving them as the Farish originals, and I hope will encourage others to take the plunge and try modifying some of the early Farish offerings that are nowhere as good as modern offerings. Progress, with all the coaches reassembled.